I had the great pleasure and privilege of announcing the launch of the Panton Principles at the Science Commons Symposium – Pacific Northwest on Saturday. The launch of the Panton Principles, many months after they were first suggested is really largely down to the work of Jonathan Gray. This was one of several projects that I haven’t been able to follow through properly on and I want to acknowledge the effort that Jonathan has put into making that happen. I thought it might be helpful to describe where they came from, what they are intended to do and perhaps just as importantly what they don’t. The Panton Principles aim to articulate a view of what best practice should be with respect to data publication for science. They arose out of an ongoing conversation between myself Peter Murray-Rust and Rufus Pollock. Rufus founded the Open Knowledge Foundation, an organisation that seeks to promote and support open culture, open source, and open science, with the emphasis on the open. The OKF position on licences has always been that share-alike provisions are an acceptable limitation to complete freedom to re-use content. I have always taken the Science Commons position that share-alike provisions, particularly on data have the potential to make it difficult or impossible to get multiple datasets or systems to interoperate. In another post I will explore this disagreement which really amounts to a different perspective on the balance of the risks and consequences of theft vs things not being used or useful. Peter in turn is particularly concerned about the practicalities – really wanting a straightforward set of rules to be baked right into publication mechanisms. 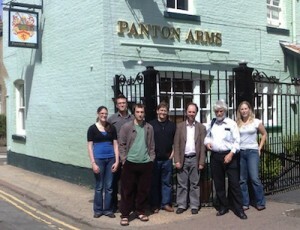 The Principles came out of a discussion in the Panton Arms a pub near to the Chemistry Department of Cambridge University, after I had given a talk in the Unilever Centre for Molecular Informatics. We were having our usual argument trying to win the others over when we actually turned to what we could agree on. What sort of statement could we make that would capture the best parts of both positions with a focus on science and data. We focussed further by trying to draw out one specific issue. Not the issue or when people should share results, or the details of how, but the mechanisms that should be used for re-use. The principles are intended to focus on what happens when a decision has been made to publish data and where we assume that the wish is for that data to be effectively re-used. Where we found agreement was that for science, and for scientific data, and particularly science funded by public investment, that the public domain was the best approach and that we would all recommend it. We brought John Wilbanks in both to bring the views of Creative Commons and to help craft the words. It also made a good excuse to return to the pub. We couldn’t agree on everything – we will never agree on everything – but the form of words chosen – that placing data explicitly, irrevocably, and legally in the public domain satisfies both the Open Knowledge Definition and the Science Commons Principles for Open Data was something that we could all personally sign up to. The end result is something that I have no doubt is imperfect. We have borrowed inspiration from the Budapest Declaration, but there are three B’s. Perhaps it will take three P’s to capture all the aspects that we need. I’m certainly up for some meetings in Pisa or Portland, Pittsburgh or Prague (less convinced about Perth but if it works for anyone else it would make my mother happy). For me it captures something that we agree on – a way forwards towards making the best possible practice a common and practical reality. It is something I can sign up to and I hope you will consider doing so as well. Above all, it is a start.